Sometimes one has a photograph one wants to share on 'Wordless Wednesday', but one has something to say about it. This photograph was in a box my maternal aunt recently shipped. She's moving, and decided instead of taking the box with her, she'd ship the contents to my mother and me. 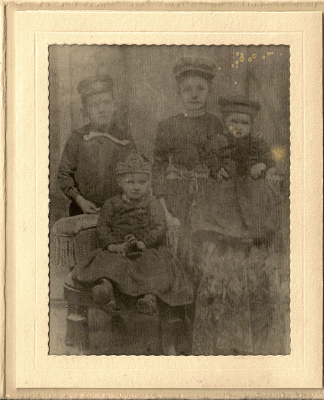 The photograph came with a letter identifying the individuals in the photograph as the older siblings of my grandmother, Myrtle Van Every, taken a few years before she was born. The letter was written by the daughter of the youngest in the photo. Evva, the youngest, was born in March of 1892, dating the photograph to not too long after that. My grandmother wasn't born until 1900. Significantly younger than her siblings, she was already an aunt by age 5. She was 38 years old before she had her first child, throwing the generational charts completely out of whack. I've written several posts about my Uncle Sam. I've posted a poem and a letter written by Willa. Here's a photograph of my grandmother with Minnie and Evelyn, taken in 1947. This photograph gives me some hope that I might someday find a photograph of my second great grandmother, Sarah Ann (Hartley) Denyer. She lived until 1898, and spent her final years living with the Van Every family (her daughter and son-in-law.) I'm confident she was alive when this photograph was taken, so a photograph could have been taken of her. Wonderful photo! You're very lucky to have it.